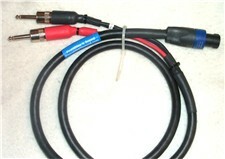 Our Power SC0-NL214's are 12 gauge biamp cables. These are for biamp applications and are made with G&H large body 1/4" ends and real Neutrik NL4FX's. Please use the pull down menu for cable length options. Note: This cable is designed to go from one amp source to two speaker inputs in the same cabinet or from two amp sources to one speakon input on a cabinet. The tail length is 8 inches. To go between amp racks or seperate speaker cabinets look at our speakon to 2 connector cables.